Nintendo Switch Online has arrived. The paid online service for Nintendo’s go-anywhere home video game system comes with an array of features that provide a great value to Nintendo Switch owners. Individual memberships are available for $3.99 for one month, $7.99 for three months or $19.99 for 12 months. Up to eight Nintendo Account holders can use a family membership, which costs $34.99 for a year. Online Play: Nintendo Switch Online allows players to engage in competitive or cooperative gameplay with people around the world in many current and upcoming games like Splatoon 2, ARMS, Mario Kart 8 Deluxe, Mario Tennis Aces, Super Mario Party and Super Smash Bros. Ultimate. As a reminder, players won’t automatically become Nintendo Switch Online members when the service starts, so they will need to purchase an Individual or Family Membership to avoid disruption of their online play in compatible games. A seven-day free trial is also available from Nintendo eShop. 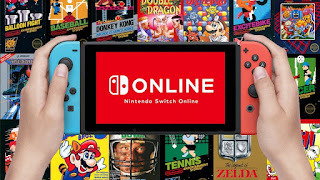 NES – Nintendo Switch Online: For the first time ever, players will be able to enjoy NES games online. Depending on the game, players can engage in online competitive or co-op multiplayer, or take turns controlling the action. Friends can even watch each other play single-player games online, and virtually “pass the controller” at any time. The 20 NES games launching with the service today are Balloon Fight, Baseball, Donkey Kong, Double Dragon, Dr. Mario, Excitebike, Ghosts ’n Goblins, Gradius, Ice Climber, Ice Hockey, The Legend of Zelda, Mario Bros., Pro Wrestling, River City Ransom, Soccer, Super Mario Bros., Super Mario Bros. 3, Tecmo Bowl, Tennis and Yoshi. Today marks the first time that Pro Wrestling has been available anywhere since it launched for the original NES. Nintendo will add additional classic NES games at no extra charge. Games planned for October include NES Open Tournament Golf, Solomon’s Keyand Super Dodge Ball. In November, members will receive Metroid, Mighty Bomb Jack and TwinBee. And in December, members get Adventures of Lolo, Ninja Gaiden and Wario’s Woods. The NES – Nintendo Switch Online library will continue to grow in 2019. Save Data Cloud Backup: The Save Data Cloud backup that comes with Nintendo Switch Online memberships automatically creates a backup copy of save data for compatible Nintendo Switch games. This makes it easy for players to retrieve save data if they lose their system or start using a new one. Smartphone App: Nintendo Switch Online expands support for voice chat via the smartphone app with a variety of fan-favorite multiplayer online games, including Splatoon 2, Mario Kart 8 Deluxe, ARMS and Mario Tennis Aces. Additionally, the entire NES – Nintendo Switch Online game library also will support voice chat using the smartphone app. Special Offers: A Nintendo Switch Online membership also gives people access to special offers, such as the exclusive chance to purchase a pair of wireless Nintendo Entertainment System Controllers, which look like the original NES controller. The accessory makes playing NES – Nintendo Switch Online games feel even more authentic. Plus, it docks with and charges on the Nintendo Switch system. NES controllers can be pre-purchased as a set of two for $59.99 (plus shipping and tax) at https://nesc.nintendo.com/nintendo-entertainment-system-controllers by users with an active, paid Nintendo Switch Online membership. Free trial users are not eligible. NES controllers are limited to one set per Nintendo Account holder, and initial orders of the controllers will ship in December.